'Times' Advice Guy Answers NPR's 'Social Q's' Philip Galanes talks about what it takes to get your modern-etiquette question answered in the Sunday New York Times — and takes a few questions from NPR listeners. 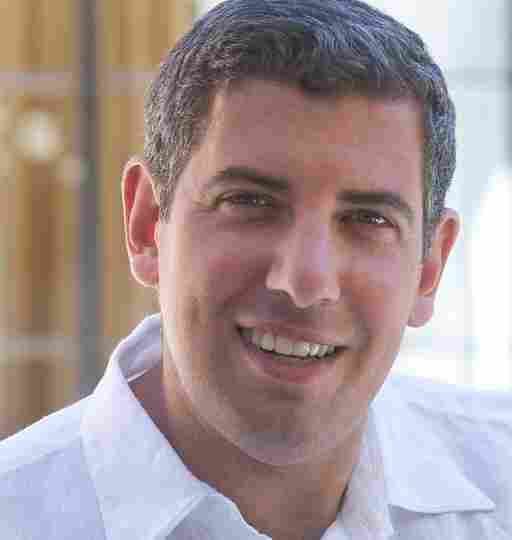 Philip Galanes is a weekly advice columnist for The New York Times. He has also written Father's Day and Emma's Table: A Novel. Philip Galanes says he has the best gig in America — at least for "a kibitzer who loves to weigh in." He's an advice columnist for The New York Times, a gig he landed after he published his first novel in 2004. The book wasn't exactly a top seller, he confesses, "but it happened that one of the people who read the book was the editor of The New York Times' Styles section. And she thought, 'This is just the voice I want advising my readers.'" Now that voice dishes advice to readers every Sunday in the column "Social Q's." Want advice on how to tell your dad he's sending text messages intended for his mistress to your phone? What about how to tell the boyfriend you met on a Jewish online dating site that you're not actually Jewish? 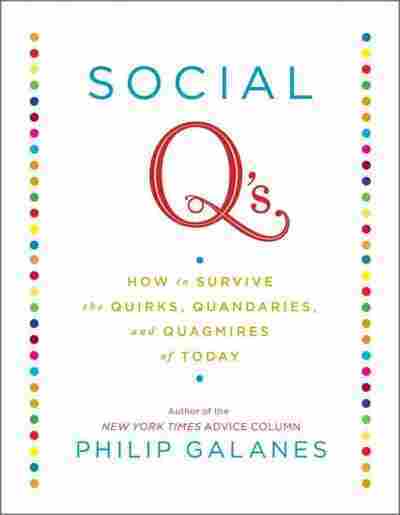 Galanes' new book Social Q's: How to Survive the Quirks, Quandaries and Quagmires of Today, which comes out on Tuesday, takes on these questions and more. If you're hoping to get an answer to your own social conundrum in the Sunday paper — and maybe into a future edition of his book — Galanes says it's best to keep your question short and sweet. "I only have 800 words" to answer, he tells NPR's Audie Cornish, "so some of the questions that will run to several thousand words ... they've self-edited themselves out." Mothers-in-law, he jokes, are popular subjects in the multipage letter category. Galanes says he looks for queries that are idiosyncratic, but that also shed light on problems that bedevil many of us. "We are walking around, all of us, into sticky situations all day long," he says. "Yours and mine are probably not the same, but it's maybe like that Six Degrees of Kevin Bacon game. They're probably not all that different, either." The book is broken down into general themes — and right up front, it's apparent that a lot of us want help telling someone else how shape up and improve their outward appearance. "It stuns me, the percentage of questions that I get that are about people wanting other people to live their better life," Galanes says. "It is how we walk through the world; we walk through the world as physical specimens, and that is the first way, and maybe the most primary way, that we encounter each other." How do you unfriend someone on Facebook but still be his or her friend in real life? "Rebekah's question goes really right to the heart of Facebook," Galanes says. "I think I, and a horde of my Social Q folks who write in to me, really clung for dear life onto this idea that finally it was our party. We invited all the people. We would determine what would be happening there. It was about us, for a change. And then life intruded, and along with life, a posse of second cousins that you're not so crazy about." "It turns out, lo and behold, that we thought Facebook was something new, but it's the same old thing. We have to be nice to people. So, to Rebekah, as much as I would like to say there's a cagey way to unfriend her or him and stay friends with them, there probably isn't. Because whenever we reject somebody, whether we do it online or right on the street corner, it hurts a little bit." How would you properly decline someone who asks you out without being negative? "When I'm not writing 'Social Q's,' I'm an entertainment lawyer and I spend a lot of time in Hollywood," he says. "And from these Hollywood people, I have learned that there is a tremendous advantage in being positive while you're being negative. When it comes to turning somebody down, I don't think anything beats, 'Thank you so much for asking, but I'd rather be friends with you.' It takes the other guy or woman off the hook really quickly. [It says] 'I'm rejecting you but I'm rejecting you with as much warmth in my heart as I possibly can.'" He says most people really don't like to hurt other people's feelings. But when people say no, it needs to be done quickly and directly. "We stall and don't respond to the request for the date," he says. "But in the romance chapter of my book, I've got examples of requests and refusals that will truly, Donte, blow your socks off. So ... do not worry about anything that you have done. I promise you, you will read worse." What's the best way to ask someone to stop talking loudly or talking on their cellphones without being confrontational? "I get this one a lot," Galanes says, "and my answer is always the same. Do it sweetly, Molly, and always with a smile on your face, because a smile says 'I come in peace.' It doesn't have to be any more than 'Could you take it down a notch, please?' Here's another tip: Do it quickly, before your head is about to explode because you're so annoyed that you know more about this guy's fantasy football picks than you could ever be expected to know." What do you think actually makes you qualified to be an advice columnist? "When I first got the column, one of my first fan letters came from a woman called Margo Howard, who is Ann Landers' daughter," he says. "Now, I basically learned to read so I could read 'Dear Abby' and 'Ann Landers' in my Brattleboro, Vt., local newspaper. So she said to me, 'When people ask you what qualifies you to answer people's questions, just tell them the thing that my mother always told me to tell them, which is: Because somebody asked me.'"